Hampi is one of the most beautiful and evocative of all historical sites in south India. It was established as the seat of the Vijayanagara Empire in the mid 14th century, a time when art and architecture flourished in South India. Several travellers from around the world visited the empire during this period and wrote glowing accounts of a magnificent city. Abdul Razzaq, a persian traveller wrote “The City of Vijayanagara is such that the pupil of the eye has never seen a place like it, and the ear of intelligence has never been informed that there existed anything equal it in the world”. The city had over half a million inhabitants making it the second largest city in the world at the time. At its peak the empire spread to entire south India encompassing present day Kerala, Tamil Nadu, Karnataka, Telangana, Andhra Pradesh and parts of Chhattisgarh and Orissa. In CE 1565 the Vijayanagara empire fell after facing defeat at the battle of Talikota. Following this the Sultanate troops conquered the capital, pillaged it for six months before abandoning it. So extensive was the damage that the city never recovered. Today only structures made of solid masonry survive as evidence to the glorious past. The site is a protected UNESCO world heritage site, spread over an area of 265 square kilometers encompassing beautiful temples, basements of palaces, remains of aquatic structures, ancient market streets, royal pavilions, bastions, royal platforms, treasury buildings and more. So come to Hampi to relieve the stories of Vijayanagara empire, hear stories of how life was in the 14th – 15th century capital city of Hampi. Learn and appreciate the unique architectural features of the time, appreciate the planning that went into building a grand city of that scale. Hire qualified guides or sign up for a guided tour, for this is one place you can easily get lost without guidance and context. Beware of touts and unqualified guides who will approach you here. The name Hampi is derived from Pampa which is the ancient name for river Tungabhadra as well as the name of local deity Pampa devi. According to the Myth Pampa devi was a devoted worshipper of Shiva. Shiva impressed with her dedication offered her a boon and she opted to marry him. The 7th Century Virupaksha-Pampa temple in the heart of Hampi was built to commemorate this event. This area before the Vijayanagara was called Pampa-Kshetra and Shiva called Pampapathi (Consort of Pampa). To this day Hampi is a major pilgrimage destination for Shiva followers in South India. Few places associated with this myth are in the area such as Hemakuta Hill and Pampa Sarovar. The region also has strong association with the great Indian epic of Ramayana. According to local folklore the Kingdom of Kishkindha or Empire of warrior King Vali was in the region. In the epic, Prince Rama comes to Kishkindha in search of his abducted wife Sita. Here Rama and his brother Lakshmana meet Hanuman, who leads them to Sugreeva, the ousted king of Kishkindha and brother of Vali. Sugreeva takes Rama to a nearby cave where he has hidden jewellery that Sita dropped as she was being abducted by Ravana, the king of Lanka. Rama kills Vali and restores the throne to Sugreeva, who in return agrees to help Rama find his wife Sita. Later Rama along with Sugreeva and his army of Vanaras wage war against Ravana of Lanka to free Sita. Many of the places mentioned the Kishkinda kanda are found in the area. Pampa Sarovara where Rama met old woman Shabari who adviced him to seek Hanuman is north of the river Tungabhadra. A short walk from there is the Rishyamukha hills where Hanuman is said to have met Rama for the very first time. Anjanadri hill that is believed to be birthplace of Hanuman is also set to the north of the river. Other places mentioned in the epic such as Matunga hill, Sugreeva’s cave, and Malyavanta hill are all located in the vicinity. 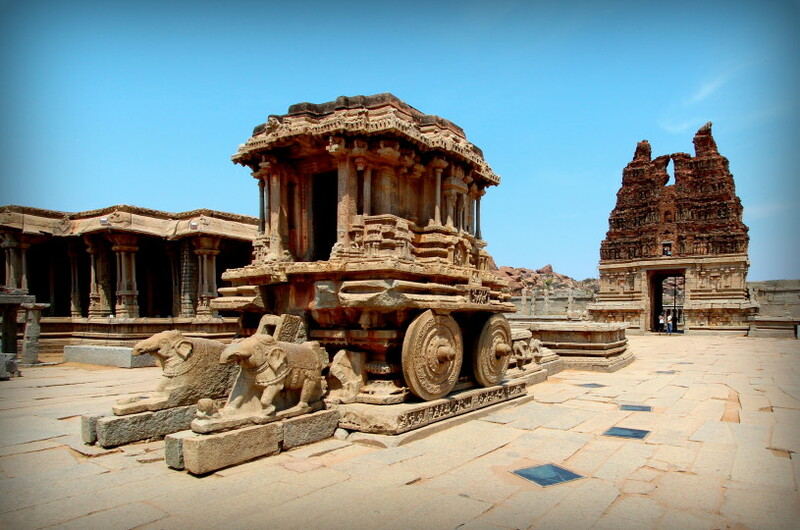 Understanding this connection of Mythology with Hampi will enhance your experience many fold! Plan to spend time in Anegundi Village, hire a local guide or go on a guided tour to explore the Mythological stories associated with the area. The destruction of Hampi in CE 1565 was so complete that no other Kingdom was able to establish a capital city here again. However people continued to reside in area and practice agriculture, so the region has retained a rural character all these years. Agriculture is possible in this otherwise arid region because of the river Tungabhadra. The Vijayanagara kings pioneered in effective use of water for the growth of their capital as well as agriculture in the region by building aqueducts, canals, check dams and bridges. Some of the Canals built in 15th Century are still in use today and provide water to agricultural lands growing sugarcane, corn, paddy and banana. 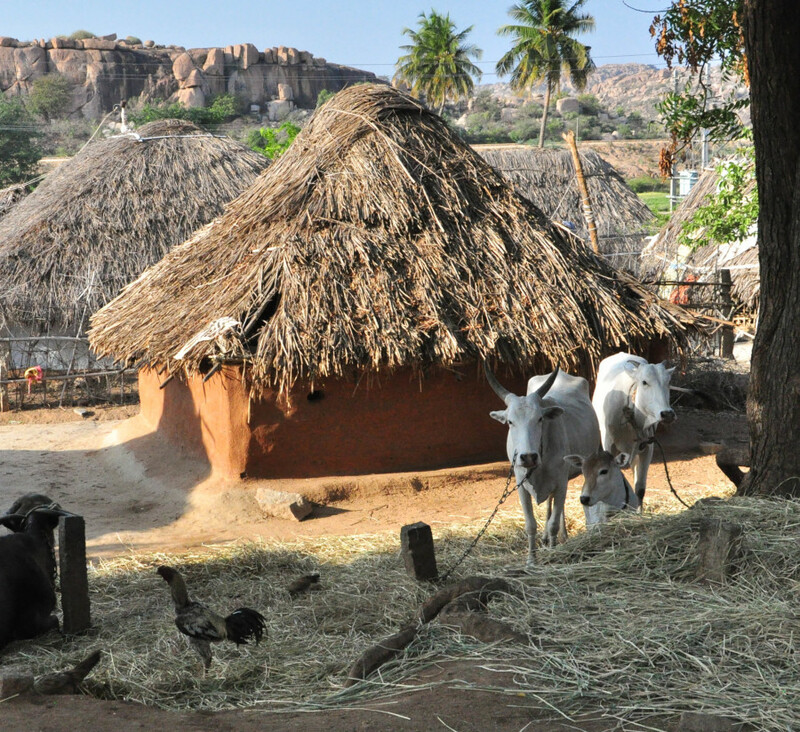 In all there are 29 village settlements in and around Hampi, these communities practice agriculture or cattle rearing. Various tribal groups such as the Lavanis and Veshegaars also reside here. In addition to this Hampi is home to several religious institutions and is a major pilgrimage destination for followers of Shiva and Hanuman. 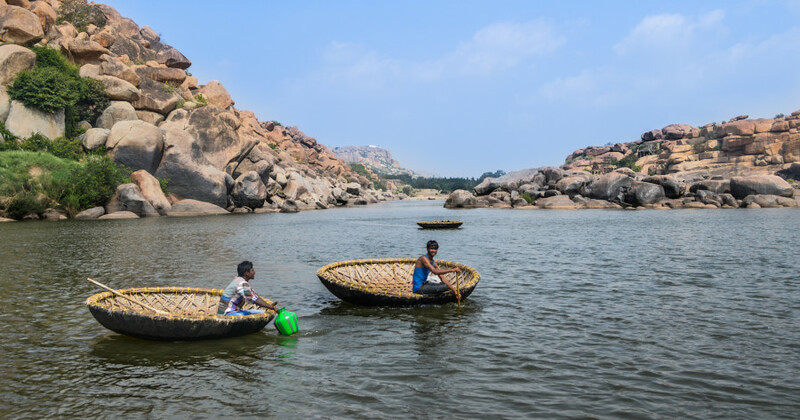 The people living in these communities are an essential part of the world heritage site of Hampi and anything rooted in these communities adds to the cultural significance of the place. The pace of life here is a welcome change for people accustomed to an urban lifestyle. While you are in Hampi remember to take some time off and experience the villages. Rent a bike and drive around the country-side and visit villages of Sanapur, Rampur & Anegundi. Walk through few of these rustic and charming villages, observe the old wooden pillared houses and interact with villagers. 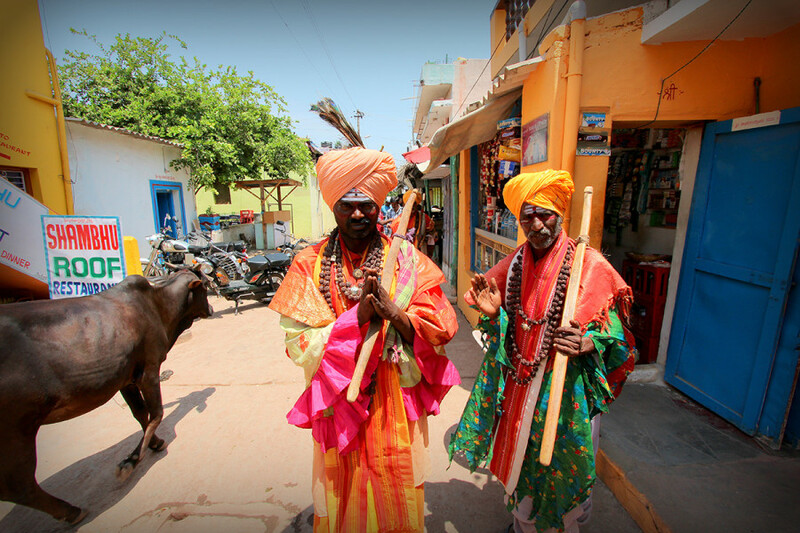 No travel experience of Hampi would be complete unless you engage with the people in these communities. 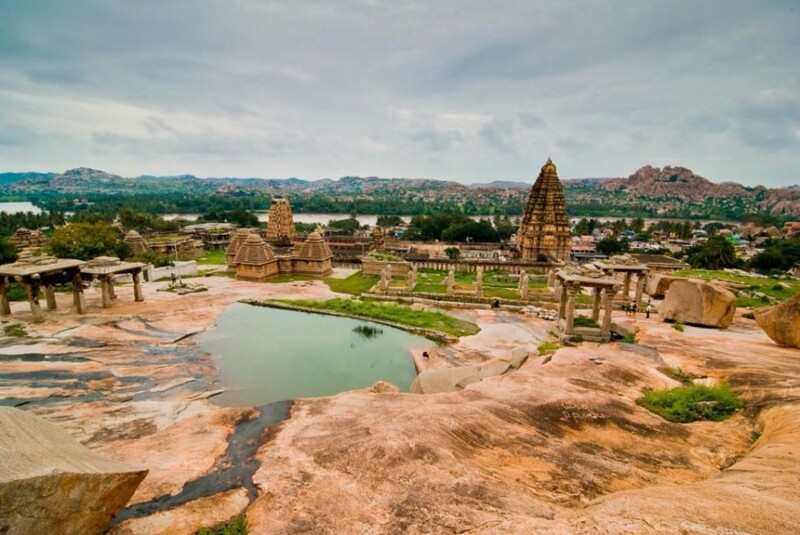 We all know of Hampi as the 14th Century capital city of the Vijayanagara empire, but evidence of earliest human settlements and presence in the area are from 2000 – 1500 BCE! 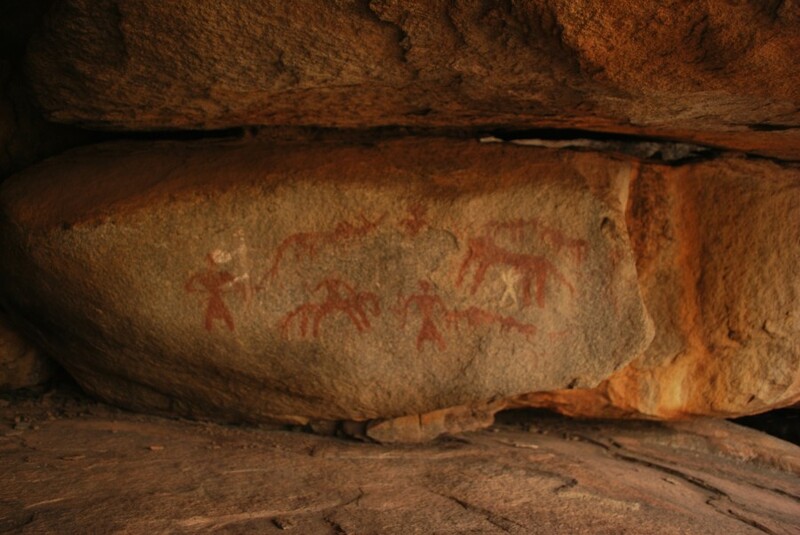 Cave paintings can be found on walls and ceilings of boulder caves located near Anegundi village. The paintings depict people dancing, hunting, holding weapons and taking part in processions. There are also paintings in geometric and mystic designs and show animals such as deer, antelopes, peacocks, humped bulls, cows and horses. Presence of horses this gives us an important clue that some of the paintings were done sometime after 2000 BCE, this is because horse were not found in India before that period. There is a lot of evidence to suggest that horses were not present in India during the Indus valley period, they were brought in by the migrating Aryans to India. The archaeological survey of India believes that these paintings were made from red ochre and have dated them to 2000 BCE. Similar paintings in other parts of India such as Bhimbetka in Madhya Pradesh have been dated to 30,000 years ago! More recently a study led by Dr. K.M. Metry have identified 19 pictographs with an ancient script in a cave. Experts in Gondi script, have identified them as Sindu (Harappan) culture-based script in Gondi dialect. Gondi is a proto-dravidian language spoken by people belonging to the Gond tribe spread over western Maharastra, Madhya pradesh, Chhattisgarh, Uttar Pradesh, Telangana and Western Odisha. The finding strengthens the belief that Gondi culture spread to the Tungabhadra basin. More importantly it would mean that the Gonds living in central and southern India could have migrated from the Indus Valley civilisation (Harappan) which flourished between 2500 BCE to 1500 BCE. Hirebenkal is a megalithic site with funerary monuments and associated habitations. It is located hidden away 9 kms from Gangavathi town on the Koppal-Gangavathi highway. 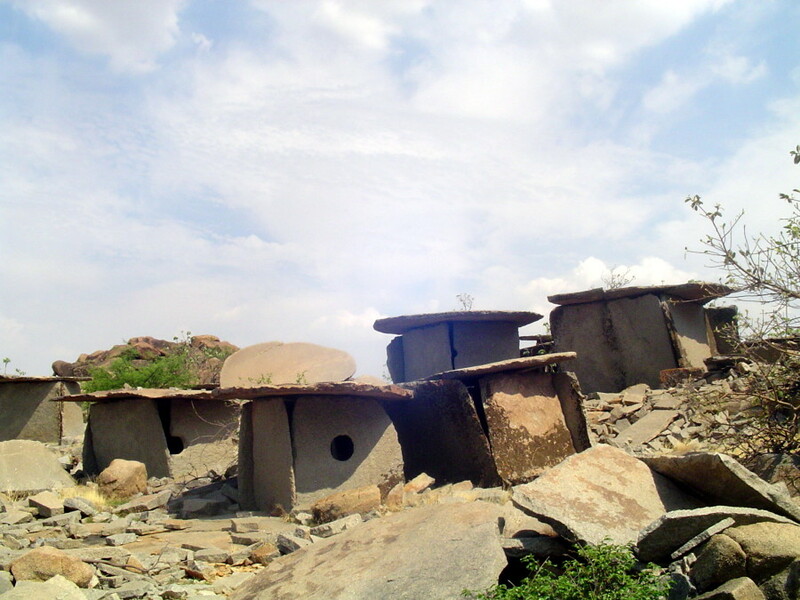 The site which is protected by ASI is spread over seven hillocks, one can spot several dolmens (three-sided chambers, with or without portholes, and with large stones called capstones forming the roof.) here arranged in circles. There are other structures such as irregular polygonal chambers and rock shelters. Hirebenkal is one of the very few Indian megalithic sites found with associated habitations. Archaeologists have unearthed rich cultural material at the site, including pre-megalithic implements, iron slag, pottery of Neolithic, megalithic and early historic period. At least 10 rock shelters contain lively paintings in red ochre. Historians and researchers date these megaliths to between 800 BCE and 200 BCE. 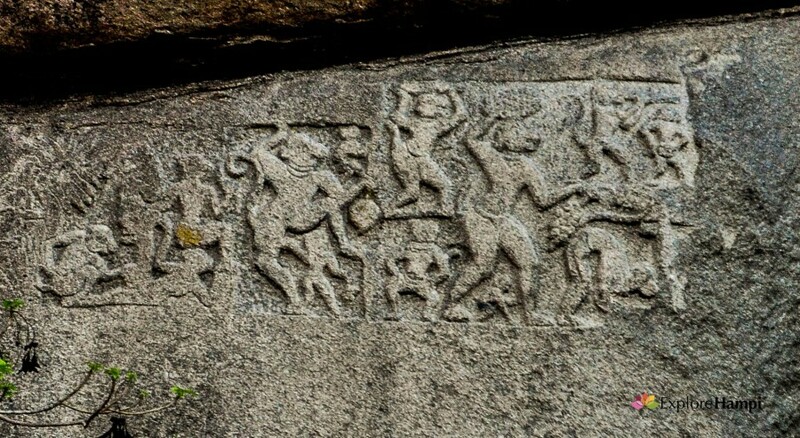 There are very few sites in India, specifically in south India where you can see evidence of prehistoric humans. Hampi and the surrounding areas give you an unique opportunity to get a glimpse into a pre-historic India! Hampi’s stunning landscape provides opportunity for few active sports. Two heritage marathons are organised in Hampi every year, occasionally cycling expeditions are organised too. There are plenty of tracks for running as well as cycling that traverse the stunning hinterland and vast ruins of Hampi. Although the tracks and routes are not well marked at this point, one can seek assistance of local organisers. Basic gearless cycles are available for rent behind Virupaksha temple at Janata Plots. Hampi with its boulder strewn hills also is a favourite hiking destination. One of the most popular short hike is the Anjanadiri hill located north of the river Tungabhadra. Travellers flock to the hill every evening to watch the sunset from here. There are uneven steps all the way to the top of the hill, the steps were constructed during the Vijayanagara period still survive. 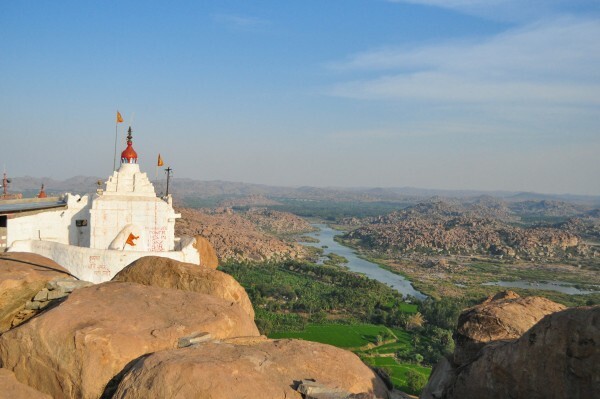 Another famous spot for short hike is the Matunga Hill located south of the river Tungabhadra near the Hampi Bazaar. Matunga hill has three approaches to climb each with varying difficulties. Other than these there are more technical hikes that can be undertaken for half a day and full day. The terrain is unforgiving with boulders, so there is a lot climbing, descending of boulders and sometimes involves navigating deep caves. While Matunga and Anjanadri can be experienced on you own, we recommend that you use professional services for other more difficult hikes. Hampi is the undisputed bouldering capital of India. Travellers from around the world come here to test out their skills. The entire landscape is made of granite crags and boulders, some bearing the marks of ancient stonemasons. However, bolting is limited, so you’ll need to bring a decent bouldering mat and some amount of gear. If you don’t have your own gear then you can rent them in Hampi, you can also get services of an instructor for the same.